Rashid-bloooow! In anticipation of Mega Man 11's October 2nd release, Capcom are teasing a Street Fighter V: Arcade Edition Air Man costume for everyone's other favorite master of wind, Rashid. 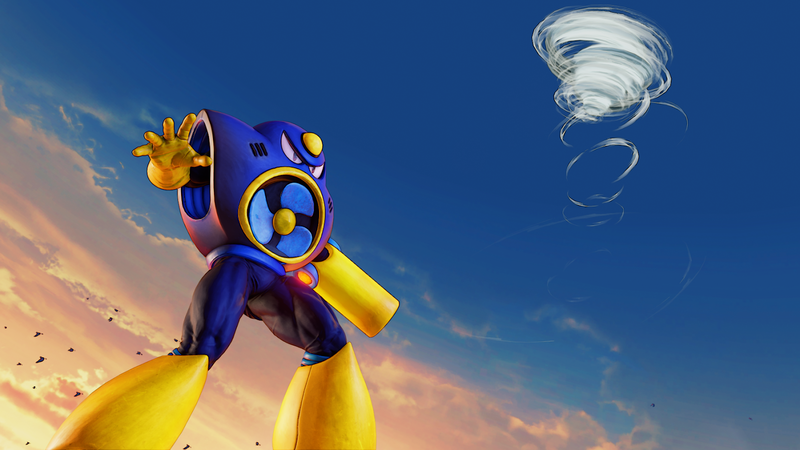 Although the distribution period for the Air Man costume was not announced, this post at Capcom Unity suggests it will become available sometime after August 2nd. Air Man is the first Mega Man-themed Character Costume to appear in Street Fighter V: Arcade Edition and it likely won't be the last. In October 2017, evidence of several unannounced Mega Man Character Costumes were discovered by credible dataminer X-Kira. These included costumes based on classic Mega Man, Proto Man, Roll, Bass, X, Zero, Axl, and Tron Bonne. Hopefully we'll be seeing some of those sooner than later. Love it. But sad it's for Radhid whom I don't even want to dabble with. Hope it's true there's more MM costumes to come. ugh... a fighter i dont care for. but when i went back i was disappointed that it wasnt the case. Airman, ya say? That's… unexpected. Heatman costume when, though? Also, I still say that I'll laugh, if the Roll costume is for Karin. But, I bet it'd be her 8 or 11 outfit (especially with 11 on the horizon), so it wouldn't be as "redundant," anyway.